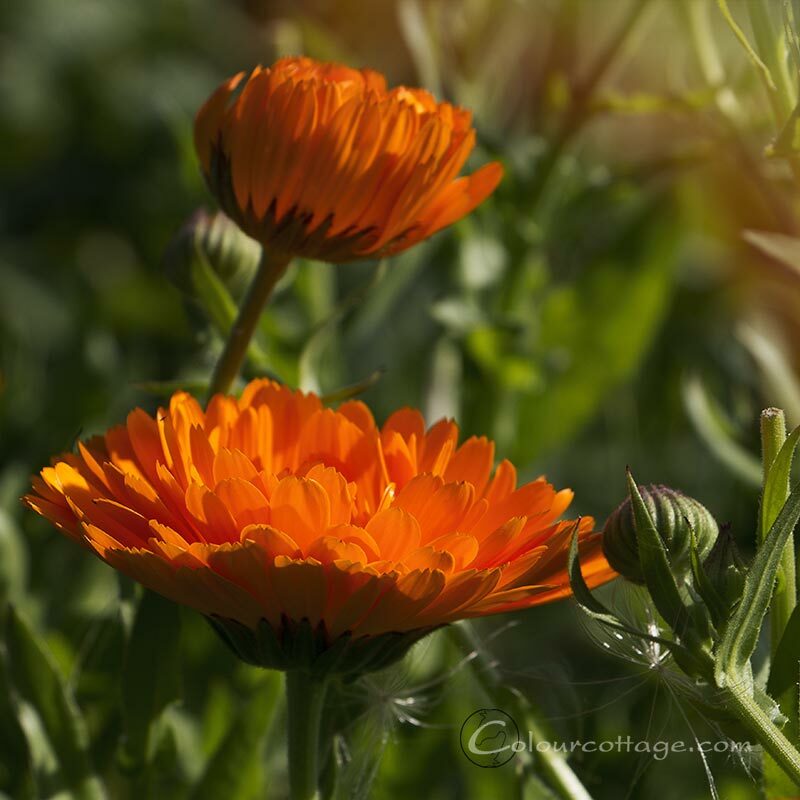 I know I said not to bother with Calendula officinalis, but as I was ridding my sadly very small weld patch from a dandelion infestation, I realized I had stopped at solar dyeing last time and couldn’t remember that I’d ever done a hot dye bath. So off with their heads and into the pot, now that I had a fresh supply of mordanted yarn. No, not the dandelions this time round, although I do seem to get good colour from the leaves. But let’s face it, there will always be dandelions. 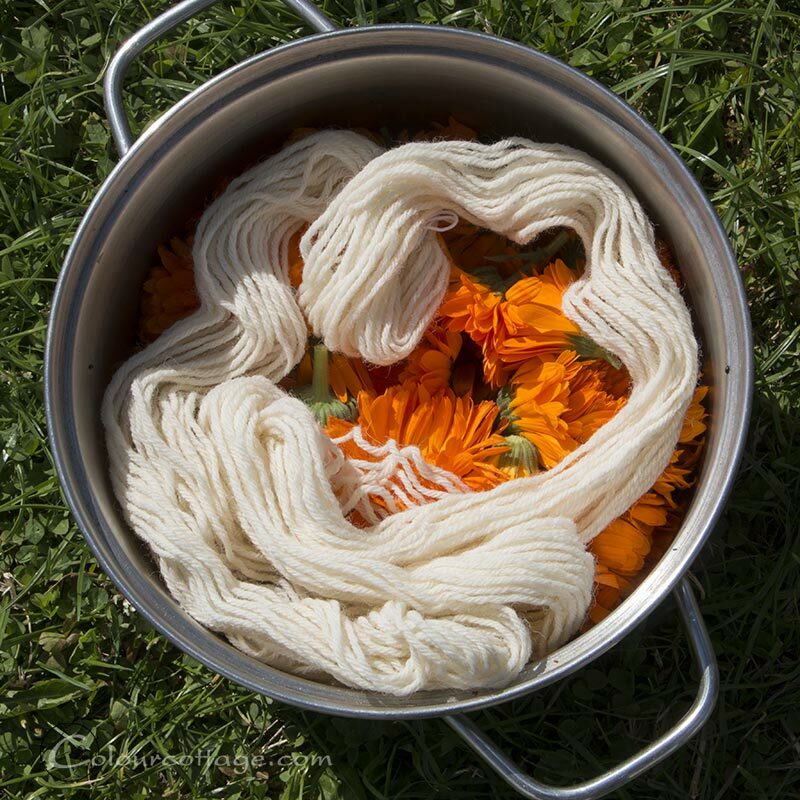 Just the one skein and an unweighed amount of marigold blossoms. 2:1 or 3:1 perhaps? Didn’t do much, so I went and picked a couple more handfuls. Well, those pastels I was talking about last week? Here ya go. Nothing you can’t get from a dozen other plants, so my previous advice stands. In fact the hank is wet in this photo for the sake of getting on with my day, so I assume it will be even paler by afternoon. If you print, eco dye with the flower heads they work well, maybe you just need a very high concentration of heads to water which probably doesn’t make it worth while for yarn. Dead buddhlia heads produce wonderful yellows. Det var ikke meget farve. Så er morgenfrueblomsterne bedre anvendt i salvekrukken. Nej, det var ikke meget man fik for den 25-øre. 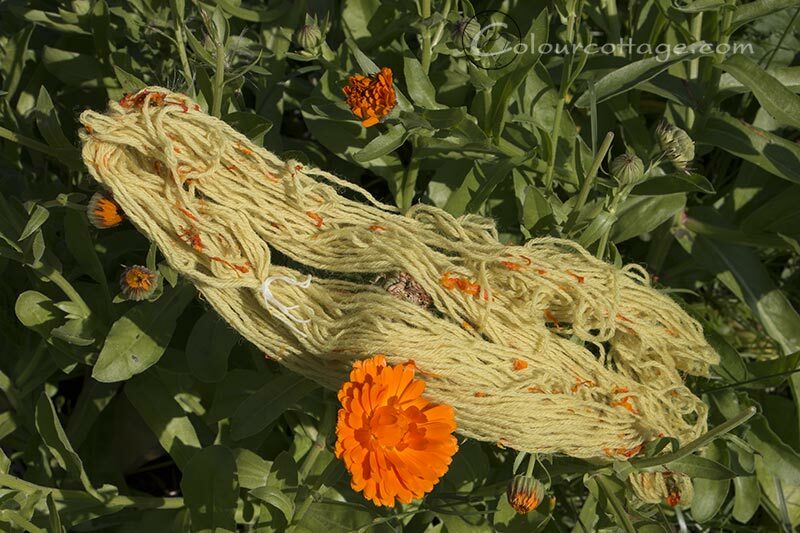 Try a high plant wool ratio and iron with calendula for a pretty olive green.